You guys…I showed such self control and patience with this project – it’s not even funny! If you hang out here regularly, you know that when an idea pops in my head I normally drop whatever other 32,000 projects I’m doing and run out to buy the supplies. Forget measuring and planning, I’ll figure it out as I go along…OK, so I still didn’t really plan it all out, but I waited 4 months, 12 days, 7 hours and 27 minutes to get started on this one (exactly-ish). I saw this pin from House Beautiful and was totally inspired to do this same planked wall treatment in my house. I loved how it was more of a rustic cottage version of board and batten versus the really classic look. I was all gung-ho to get started, but thought I better swing this idea past the Mr. since it involved a little more than paint. He liked the look, but doubted my DIY skills (oh ye of little faith!) and he had all these pesky questions about how I would run this all the way up the stairs, keep them straight, cut the angles etc…clearly he isn’t the wing it type! Also it was spring so the weather was too nice to be cooped up inside with an endless DIY project. He made me pinkie swear (and I’m a woman of my word) that I wouldn’t tackle any big projects over the summer and revisit this idea in the fall. Fine, no problem, I can handle this – I only obsessed about this wall every time I walked up the stairs and counted down the days til I could start. Being a woman of my word I waited until exactly the first day of fall (September 22, but who was counting?) and little man and I hit up Lowe’s! I’ll be posting a whole super easy, no power tools required (not that I wouldn’t love to use some power tools, so if anybody wants to send some my way I’d be all over it!!) tutorial on how I did this (complete with my usual DIY hilarity and hi-jinks – let’s just say there came a point where the Mr. and I were actually having a discussion about which one of us should stand on the ladder based on our life insurance policies…but I promise this is easy. Super easy if you don’t go up the staircase like we did!). So stay tuned for the how to, but today I’m just sharing the prettiness! I found this cool bench at our local ReStore for $15! 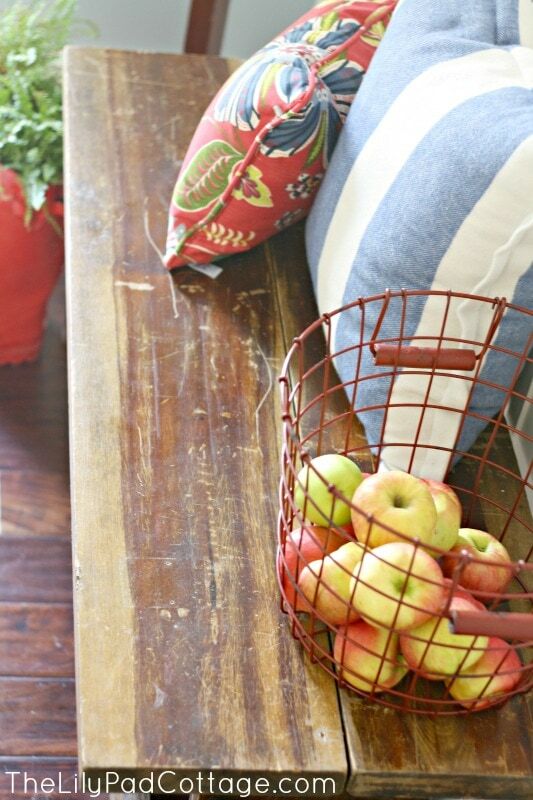 I totally love it and it’s so much more practical than the table that used to sit here. 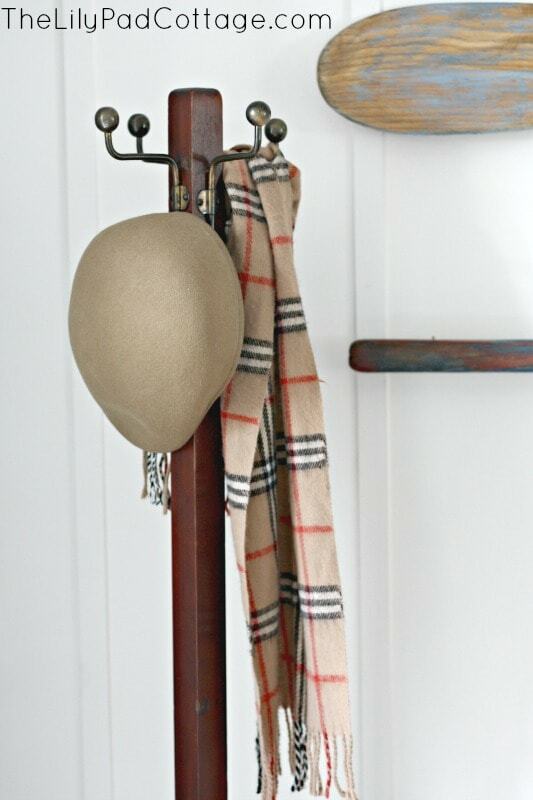 I got the coat rack for a steal too at the antique flea market, it was originally $75, but I only had $42 left in my wallet and the guy let me have it after I flashed my “woe is me I’m so broke, but that coat rack needs to come home with me, puppy dog eyes”. I keep my Grandfather’s old hat here (he was quite the sharp dressed man) as a memory to him and it just makes me smile. 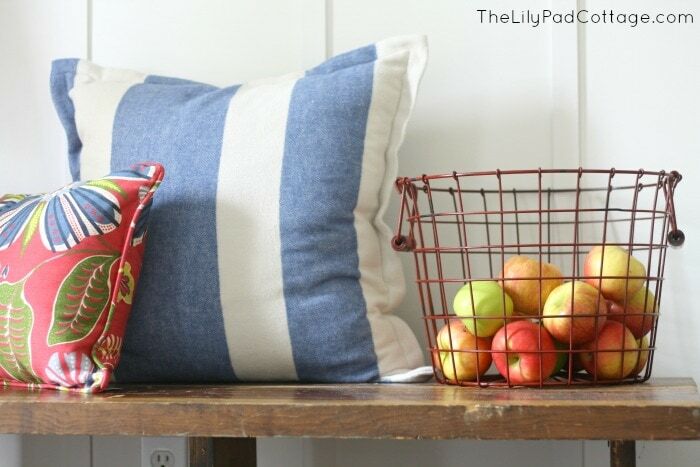 I grabbed these pillows for a pop of color from HomeGoods and I already had the oars here before (ok well 2 out of 3, I am an oar hoarder and added another one to my collection). Ahhh, I can’t even explain how happy I am to have this project done! 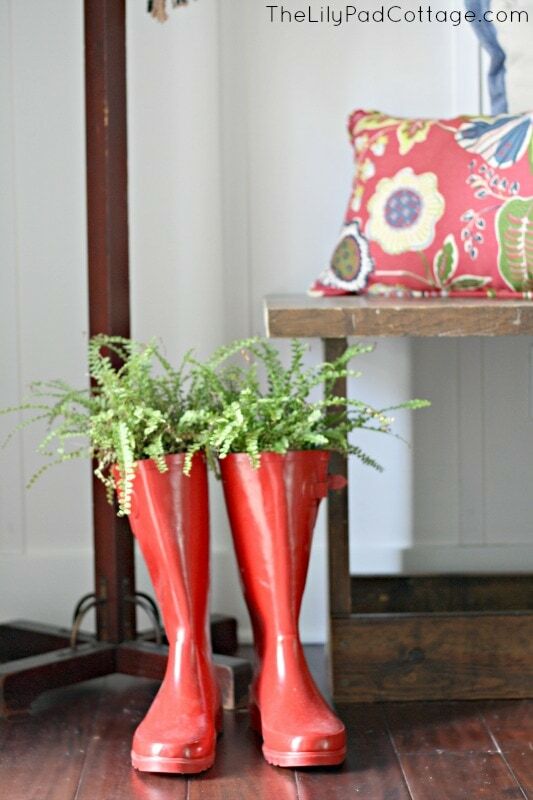 It made such a big difference just adding a bit of character right when you enter our home. Not to mention you don’t notice how steep and scary our staircase is as much (not my favorite part of our house, but I chose having a bigger kitchen over a pretty staircase). UPDATE : Click here for the full tutorial. I love your new wall! And kudos for being able to wait all summer! 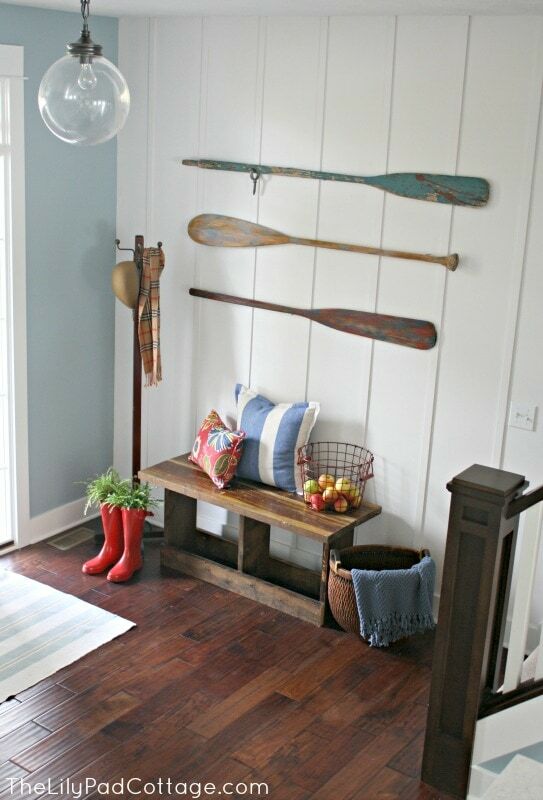 LOVE the planked wall, Kelly! So glad you finally got to do it! 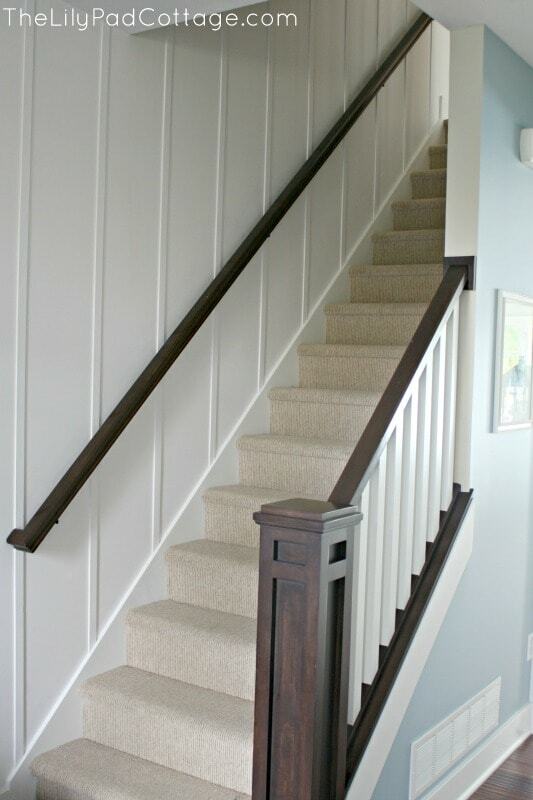 It really gives the entry and staircase more character! Beautiful job! What is the name of the wall color paint, the white and the blue and by who. LOVE IT! Love it! I can’t wait for the tutorial! Awesome look. I’m having a small tantrum of jealousy over here. You got the bench for FIFTEEN DOLLARS?!?! So. jealous. Awesome please post tutorial I have to do this in my hall. Oh, I love what you did and enjoyed the real life funny post! Your entry is gorgeous!!! Ours is a totally different layout, but if I had something like this I would totally do that. But I have been eyeing that idea for our basement staircase (I just haven’t told the hubby yet). 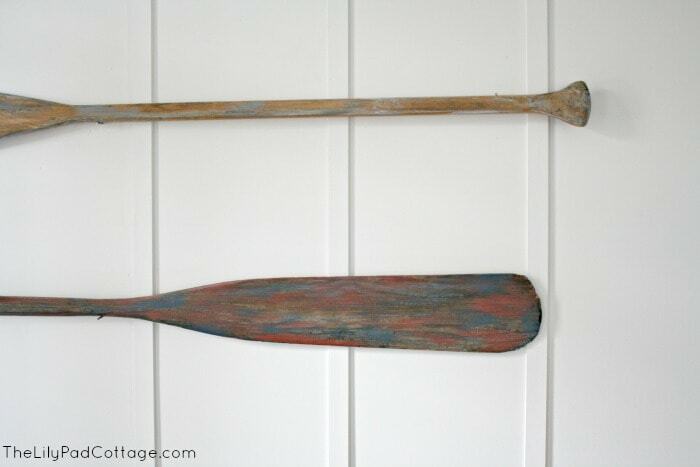 I am also super jealous of your oar collection. I can never seem to find any! Plus hubby thinks I’m nuts. Where we live there is only one house between us and the lake (we can see it) but hubby still thinks anything too nautical is “over the top”. Silly man! You for SURE need some oars Sherry :) I get all mine at flea markets but there are a zillion lakes around here so they seem to always be around. Good luck with your staircase! I LOVE it! So cool the texture and interest it adds! And I hope you get some power tools given to you – I’d lvoe to see what all you would create with those at your disposal! the styling is lovely too! Ha, glad I could give you proof it can be done! Good luck with your staircase! It’s a total and complete KNOCK-OUT. I love it. I’ve been wanting to do “something” in my hallway, but tradish B&B won’t work for me either. This. This could so work. It looks so great! You never fail to amaze me!! I was eyeing that bench trying to figure out how to build it. I am a bench nut. I am going to build me one. Oh, and I love the wall too. It fits what I want to do in our downstairs bath, so I pinned it. Great job, can’t wait to see how you did it. Those stairs do look tricky. Oh go for it, you could totally build a bench like this! Looove this wall treatment! It’s amazing how such a simple thing can make such a big difference! Thanks Julie, I know right? It made such a big difference! So beautiful Kelly!! Pinned to the BHG board and scheduled for FB today! Looks awesome! I love this look of the really narrow B&B…it almost looks like planks. This is a very popular exterior siding choice in my area right now and I always wondered if it would look as good inside. Great job! I love your house! That was exactly what I was going for, our exterior is this wide board and batten so I really wanted to carry it inside :) Thanks so much! I love what you have accomplished here – such a great look! 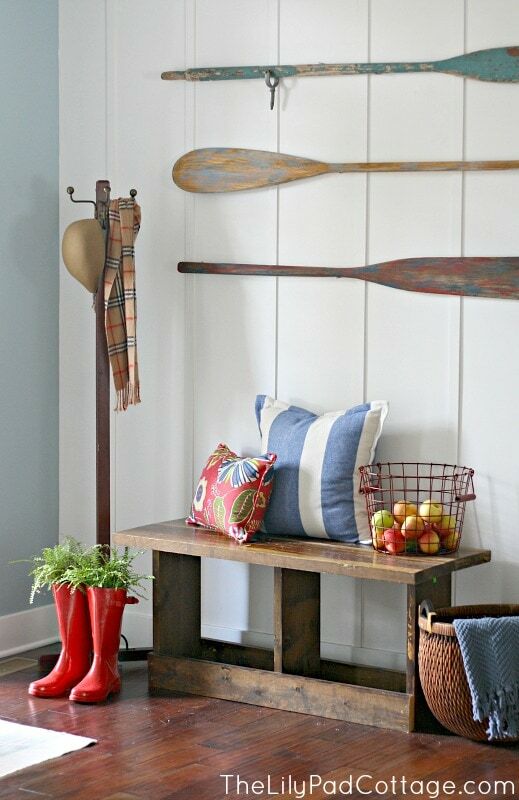 How did you hang the oars? I have a couple that I want to hang on my wall, but haven’t found a way to do so that doesn’t have them tipping a bit from the top. Love all of this! I wish that I had your decorating skills. Oh my goodness – I need this in my house ASAP! I’m now going to sit on pins and needles waiting for the tutorial – it would be SO perfect in my son’s room! Kelly it looks amazing! Give yourself a huge pat on the back! I’m a “wing-it” girl too and sometimes a prayer is all you need :-) The stairs are cute and all your accessories look great together. Well done! Looks amazing Kelly! Yal did a fabulous job! Love this Kelly! I really want to live in your house! I think I might have to use your shoe bin idea for our new puppy too! Oh man puppies are the best but I could do without the chewing!! Love your new little guy he is soooo adorable! Loving this plank look and it’s exactly what I’ve been looking for for my bedroom…I am a new bloglovin’ follower!! Yay welcome Cheryl, thanks for following along!! I ADORE THis!!! You did an amazing job, I may have to steal, love that is goes to ceiling:). I love the wall, I cant wait to see the DIY on this project. :-) Thanks for sharing and have a blessed day. 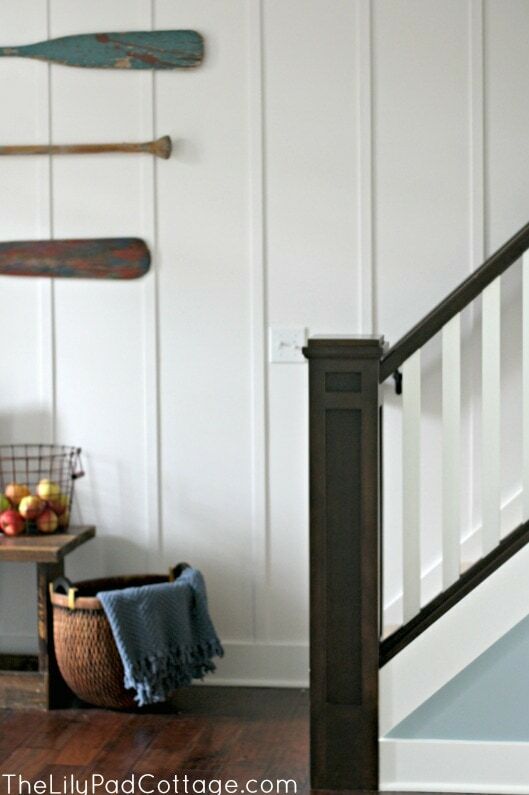 I love wood walls of any kind, and board and batten is a classic, lovely look. 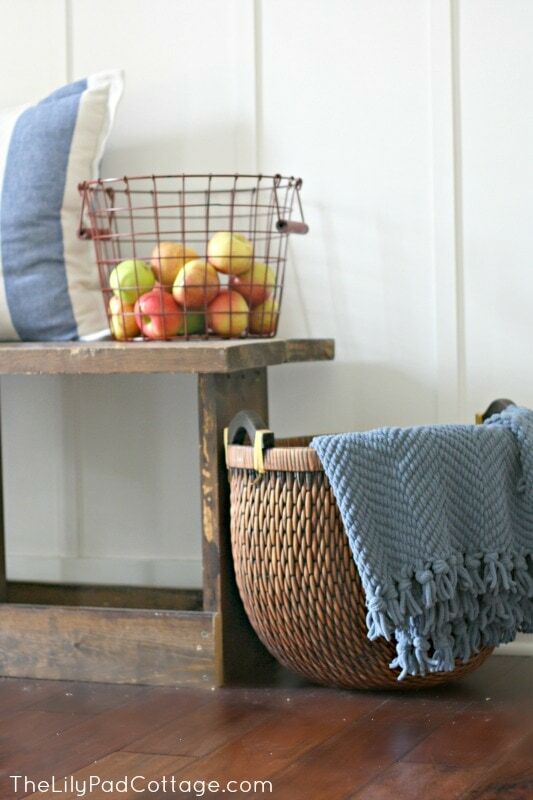 It looks lovely in your home, and your little bench is just too cute. Thanks so much Kim, I’m with you can’t get enough wood paneled walls! Now that is awesome! Love the new wall, really is a cool look! This turned out amazing! We just bought a house that we are renovating and I’m really really want to add a planked wall at least somewhere. Like REALLY! You gave me confidence and the inspiration that maybe I can do it myself one day! Your home is absolutely beautiful. The lovely Trish at Uncommon Designs told me I needed to stop by and check you out! Hi! I love your staircase! Did you put in the newel post? I was wondering where you purchased it. Thanks!